Find your San Antonio Dealer or have product shipped. Thank you for visiting our San Antonio, Texas Dealer's Listing! We are right here in San Antonio, Texas. I generally stock the most popular items. We can have what you need within a day should it not be in stock. Call Stewart for fast AMSOIL service! Serving the following areas in and around San Antonio: Seguin, Floresville, Pleasanton, Kerrville, Boerne, New Braunfels, Castrville, Bandera, Fredricksburg, Comfort. Our dealer closed his doors so we need a new dealer anywhere in the area to join us! Your name here! If you need quarts, a bottle of fuel performance improver or a drum for your repair shop we have what you need! Were open to the public. Call us here in San Antonio or order directly online from the AMSOIL HQ (shipped from Arlington) . But first call for local stock and pick-up. Join as a Preferred customer and save 25% on all orders as well as have the product packet and wholesale price guide mailed to you by entering the AMSOIL Store and select "Preferred Customer Option" at the top of the page. Thanks for stopping on my San Antonio, TX AMSOIL page! We are here to serve you with the greatest courtesy and service. My name as you can tell is Stewart and I assure we will be your first and only stop for your synthetic lubricant needs. If we don't answer the phone, please leave a message or email. If you don't get a reply within a reasonable amount of time call our supply house at 800-579-0580 and let them know you first landed here at Stewart's page. We are part of the largest Texas group of dealers and can provide top service should you need a quart for your passenger car or 10 drums per month for your manufacturing facility. If you will be buying 2-or more cases yearly or if you have a group you want to provide AMSOIL to it's best to use the Preferred Customer or Dealer form. This gives you the benefit of ordering direct at the wholesale price all the time as well as have the ability to upgrade to dealer as demand increases. See our dealer section for more on that. Why change oil every 5000 miles when you can go at least three times longer and 40 times longer using the bypass system. If you spend 30 minutes each time you wait at a quick lube, when you use the AMSOIL bypass you are saving TWENTY hours. That's valuable time. You also save money on oil, filters, wear, add life to your engine, pick-up 2 to 8.5% in mileage and lower engine temperatures. AMSOIL - used by the top teams of racing, Other brands may fancy up the skin with their logo but that is not what's used under the hood. Experienced factory racing organizations know AMSOIL results in greater dependability. But the core of our customers in San Antonio are average commuters and commercial businesses looking to cut costs in fuel and average vehicle life. Texans are fans of AMSOIL!! It delivers. It makes their machines really perform and when someone brags about their so called "better" oil, sooner or later the tests come out showing that product was nothing more than a name.. Or what Al call "A Johnny Come Lately!" Did you know most of the testing AMSOIL publishes all the way back from the early 70's were done right here in San Antonio? At the Southwest Research Institute (SwRI) which has even stretched the limits of many tests beyond proving AMSOIL is really what founder Al Amatuzio set out to accomplish - The Best! 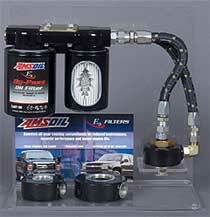 When using AMSOIL, you may want to consider the By-Pass filtration systems. Change oil at 200,000+ oil intervals. Just change the full flow (EA OIL Filter) yearly and the EABP by-pass unit bi-yearly or up to 60,000 miles and top off. We recommend oil analysis after each cycle of new filters at least to monitor so you have full knowledge of the life and superiority of the AMSOIL product, We have prepaid analysis kits available including shipping costs. We recommend using Oil Analyzers as they specialize in synthetic oil testing and give your fleet the most accurate information to extend oil use and spot conditions accurately. Now choose the oil you need and the nanofiber oil filter. Both designed and guaranteed for 25,000 miles. Our oil filters use our own specifications plus licensed from Donaldson the same media required by the US ARMY for the Abrams tank. AMSOIL is the only company to offer this technology to automobiles and soon - motorcycles. You save money because you are changing your oil less often! You also help reduce America's dependence on foreign oil. Your oil is filtered more effectively and efficiently, thus removing more wear particles and reducing the contaminants that cause damage to your engine. Engine life is extended. Your engine has more oil available to lubricate, cool and protect your engine, once again extending the life of your engine. Removes more small particles and soot contaminants that can cause engine wear and premature damage to your engine. Filters particles less than 1 micron in size. You will get more use out of the investment. Save even more with our new (EaA) - absolute efficiency nanofiber air filters guaranteed to last 100,000 miles or 4-years. At one year or 25,000 miles the AMSOIL (Ea) air filter can be cleaned by compressed air or vacuum at the same time as your oil change helping you consolidate maintenance. NO OIL NEEDED! This reduces your air filter costs to about $9 per year rather than buying a new cellulose air filter every 10,000 miles. The new AMSOIL Ea Air filter is OEM Certified for fit and warranty compliance. AMSOIL Synthetic Motorcycle Oils not only provide superior protection for motorcycle engines, they also provide superior gear protection, meeting API GL-1 gear lube viscosity requirements. AMSOIL Synthetic 10W-40 Motorcycle Oil (MCF) meets SAE 80W-90 gear lube requirements, while AMSOIL Synthetic 20W-50 Motorcycle Oil (MCV) meets SAE 90 gear lube viscosity requirements. Pick it up here in Corinth. Local San Antonio demand has created a great need for AMSOIL dealers in this area, especially in the rural outlying areas (if there are any anymore). You get excellent support from myself as I am part of one of the most resourceful AMSOIL dealer groups in the country. We can send local and web generated leads your way. The #1 question we get from local customers is, "Where can I find AMSOIL here in Pilot Point?" or any other city. Our distribution center can quickly have your product anywhere whether you need 2-cycle for your dirt bikes or ATV oil, or if you have a weed eater you need to last in the dusty seasons of West Texas. Well, we are eager to help you out! Be sure to check out our Dealer page. AMSOIL is known for advanced lubricants - it goes without saying. But it is interesting to know which two product lines are the most advanced in the whole line well beyond anything else available in the market?? Both of these significantly aid the San Antonio, Texas stop & go traffic market. How many of you who own a grease gun know how old the grease is inside the gun? I bet most people answered, “I’m not quite sure.” Outside the heavy-duty and off-road industries, applications requiring grease are among the most overlooked when it comes to maintenance. That’s partly because many equipment manufacturers are designing sealed for- life components that require no additional lubrication. Nonetheless, there are applications that still require us to get out the old grease gun. So, after first checking your owner’s manual to see what needs greasing, your next question is probably, “What grease should I use?” This is a great question because there are lots of different greases on the market. Just like motor oil, grease can be chosen based on the intended application. Applications that operate in or near water or are frequently subjected to moisture, like boat trailers or ATVs, need a grease with exceptional corrosion protection that stays in place to keep out moisture. These greases are likely termed “water-resistant” or something similar, like AMSOIL Synthetic Water-Resistant Grease (GWR). Heavily loaded applications, like dozers or tractors, need grease to prevent wear and corrosion, seal out contaminants and resist impact. Heavy-duty applications require grease with superior adhesive qualities that will stay in place during demanding service. Such products are likely labeled “heavy-duty” or “off-road,” similar to AMSOIL Synthetic Polymeric Off-Road Grease (GPOR). If you work with heavy-duty equipment or have customers who use it in their businesses, you know the importance of high-quality grease. Although these two application examples might seem obvious, there are hundreds of others that can make people wonder if they are using the right grease. Oftentimes the equipment manufacturer will recommend a particular grease by providing the preferred NLGI grade and thickener system. This can be essential information for selecting the appropriate grease. The NLGI grade is a standard for grease consistency, or hardness. This nine-number scale runs from #000 to #6, with #000 being the thinnest, almost semi-fluid product, and #6 being very solid. By volume, most greases tend to be in the NLGI #0 to #3 range. There are several options because greases are purpose-built for specific performance. 1. The wrong type of grease was used. To ensure you are choosing the proper grease, be sure you understand specifics of the equipment, its operating environment and the loads or speeds the equipment endures. 2. The new grease is incompatible with the old grease. This typically results in excessive softening caused by the interaction of different thickening systems. This is normally identified by grease dripping or running out of the application. The safest strategy is to not mix greases, although there are published charts indicating which grease thickening systems are compatible. 3. The greased component was contaminated. This can happen in the pre-greasing stage from using a dirty grease-gun tip, not cleaning zerk fittings or using open containers of grease. Grease can also become contaminated from the introduction of water, dirt or chemicals into the lubricant while in the application. 4. Too much or too little grease was applied. Failing to maintain greaserelated parts with adequate amounts of the correct lubricant can result in component problems, equipment downtime and costly repairs. The lack of grease can cause failure, but too much grease is often the primary cause of failure because the excess grease causes high temperatures, which in turn oxidizes the lubricant. Grease life is affected by heat, mechanical stress and environmental conditions. As greases age, they tend to become dry and brittle and lose their fluid characteristics. Grease should be examined after as little as one year in storage to ensure the base oil has not significantly separated and that the grease has the proper consistency. Now, if you answered, “I’m not quite sure” to my first question, it’s probably time to change out the grease in that gun. Clean - suspend contaminants and prevent them from adhering to components. Critical for used vehicles where maintenance do not exist. Cool moving elements - Reducing friction will reduce the amount of heat that is generated. AMSOIL PAO base stocks are extremely efficient at absorbing heat from the contact surface area and transport it to a location where it can be dissipated. Prevent contamination (seal) - We rely on the lubricant to act as a dynamic seal in locations such as the piston, piston ring and cylinder contact areas. This minimizes combustion by-products (for example) from contaminating the lubrication system. AMSOIL Synthetic Lubricants and industrial oils excel in Carbon Formation Resistance, Antifoam, Demulsibility and Hydrolytic stability. Dampen shock - AMSOIL offers more sheer strength. This is AMSOIL's most commented on attribute. Our large vehicle and motorcycle customers frequently comment on noise and vibration reduction. Prevent corrosion - A quality not inherent in conventional petroleum lubricants. This can be accomplished either by chemically neutralizing the corrosive products or by setting up a barrier between the components and the corrosive material. Transfer energy - A lubricant may be required to act as an energy transfer median as in the case of hydraulic equipment or valve lifters in an automotive engine. AMSOIL ATF and hydraulic oils add a significant performance boost, last longer and reduce energy needed to accomplish the same task but to heat reduction. Eli Tomac and Wil Hahn ready to complete in 450 class next season. The GEICO/AMSOIL/Honda Supercross/ motocross team has an enviable reputation for developing young riders into world champions, while also providing legends like Mike LaRocco and Kevin Windham a place to cement their legacies. The 2014 season will mark a significant transition in this established philosophy as the team expands its presence to include two 450 class riders, each promoted from within the team’s impressive stable of 250 class riders. Starting with the 2014 Monster Energy Supercross season-opener in Anaheim, Calif., champion 250 riders Eli Tomac and Wil Hahn will move up to ride AMSOILbacked Honda bikes in the elite 450 class. Following in Trey Canard and Justin Barcia’s footsteps, Tomac will be the third GEICO/AMSOIL/Honda rider to reach the pinnacle of the sport after joining the team as a fresh-faced amateur. The Cortez, Colo. native was in his early teens when he first caught the eye of team owner Rick Zielfelder. It’s been a partnership that’s produced dozens of race wins and the 2012 Supercross 250 West title. After a breakout season in 2009, Hahn joined the team for the 2010 season. Unfortunately, in his first race with the team, he broke his back during practice and spent the bulk of the next two seasons recovering from various injuries. Despite the setbacks, Hahn’s presence became a valued one on the team and the group’s patience was rewarded this season when he finished on the podium in all nine 250 East races, including two wins, on his way to the title. Team owner Jeff Majkrzak said expanding to two 450 riders is a big step, but one the team has been working toward for a long time. Tomac and Hahn are both excited to make the transition to the top class in familiar surroundings. The Supercross world will get a preview of the new 450 duo when they take to the track at the October 19 Monster Energy Cup at Sam Boyd Stadium in Las Vegas.